Bajra, commonly known as pearl millet, is gluten free, and Non allergetic.It is comparatively high in proteins and has a good balance of amino acids. Thus, it plays an important role in metabolism.This whole grain supports weight loss as the high fiber content leads to a feeling of fullness for a prolonged period of time.It controls blood sugar levels and hence good for diabetic.Now we learn to make Bajra idli. Wash and Soak bajra seperately.Soak idli rice seperately for 4 - 5 hrs or over night. Soak urad dal and half a tsp of fenugreek seeds together before 1 hr of grinding. Grind Urad dal till soft and fluffy. Grind Rice in a mixie or Grinder, when 3/4 of the rice is Ground, add bajra and grind it into a little bit coarse paste with needed water. Mix together Ground urad dal and ground rice with needed salt.Normally i use hands to mix well. Consistency should be like normal idli/dosa batter consistency. Pour the batter over the idli mould, and steam cook for 10 - 12 minutes. Insert a spoon to check, whether idli's are done. if it comes out as clean spoon,idli's are cooked else cook for few more minutes. 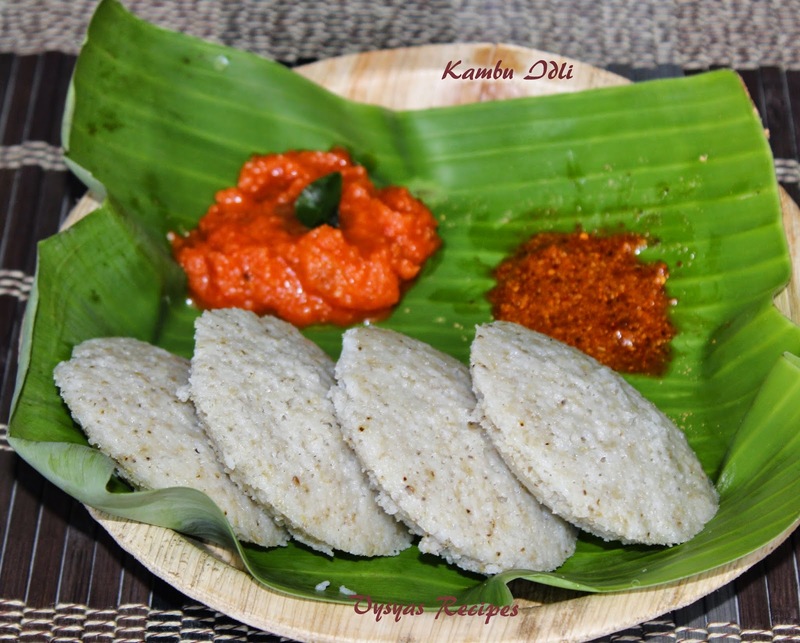 For detailed description plz visit my soft idli's procedure. Urad dal Consistency should be fluffy,it should not be watery.So add water little by little to grind the urad dal.This is very important step to prepare soft and fluffy idli's.Even if rice consistency is watery, if u mix with urad dal batter, after fermentation, it becomes thick. While mixing urad dal and rice batter to gether, stir from the bottom of container . usually i use hands to mix the batter. You can also add 1/4 cup of water, to batter and make kambu dosa's. Sounds like a very delicious and healthy idli recipe.